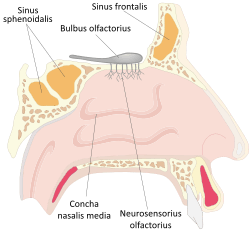 In certain Asian countries such as China, Japan, South Korea, Malaysia, Thailand and Bangladesh rhinoplasty is common to create a more developed nose bridge or "high" nose. A high-bridged nose has been a common beauty ideal in many Asian cultures dating back to the beauty ideals of ancient China and India. The aquatic ape hypothesis relates the nose to a hypothesized period of aquatic adaptation in which the downward-facing nostrils and flexible philtrum prevented water from entering the nasal cavities. The theory is not generally accepted by mainstream scholars of human evolution. 1 2 Jean-Baptiste de Panafieu, P. (2007). Evolution. Seven Stories Press, USA. ↑ Sansom, George; Sir Sansom; George Bailey (1961). A History of Japan, 1334-1615. Stanford studies in the civilizations of eastern Asia. Stanford University Press. p. 360. ISBN 0-8047-0525-9. Visitors to Kyoto used to be shown the Minizuka or Ear Tomb, which contained, it was said, the noses of those 38,000, sliced off, suitably pickled, and sent to Kyoto as evidence of victory. ↑ Pray, W. Steven (2005). Nonprescription Product Therapeutics. p. 221: Lippincott Williams & Wilkins. ISBN 0781734983. ↑ Finlayson, C (2004). Neanderthals and modern humans: an ecological and evolutionary perspective. Cambridge University Press. pp. 84. ISBN 0-521-82087-1. 1 2 Rae, T.C. (2011). "The Neanderthal face is not cold adapted". Journal of Human Evolution. 60 (2): 234–239. doi:10.1016/j.jhevol.2010.10.003. PMID 21183202. ↑ Hernández, M.; Fox, C. L.; Garcia-Moro, C. (1997). "Fueguian cranial morphology: The adaptation to a cold, harsh environment". American Journal of Physical Anthropology. 103: 103–117. doi:10.1002/(SICI)1096-8644(199705)103:1<103::AID-AJPA7>3.0.CO;2-X. ↑ Mladina, R; Skitarelić N; Vuković K (2009). 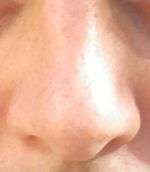 "Why do humans have such a prominent nose? The final result of phylogenesis: a significant reduction of the splanchocranium on account of the neurocranium". Med Hypotheses. 73 (3): 280–3. doi:10.1016/j.mehy.2009.03.045. PMID 19442453. ↑ Morgan, Elaine (1997). The Aquatic Ape Hypothesis. Souvenir Press. ISBN 0-285-63518-2. ↑ Gould, S.J. (1996). The mismeasure of man. Norton and Company: NY. ↑ Jones, Doug (1995). "Sexual Selection, Physical Attractiveness, and Facial Neoteny: Cross-cultural Evidence and Implications". Current Anthropology. 36 (5): 723–48. doi:10.1086/204427. JSTOR 2744016. ↑ Opitz, John M.; Gilbert-Barness, Enid F. (2005). "Reflections on the pathogenesis of Down syndrome". American Journal of Medical Genetics. 37: 38–51. doi:10.1002/ajmg.1320370707. PMID 2149972. ↑ Fuente: Series de porcentajes obtenidas en un amplio estudio realizado por el CMD (Centro Médico Down) de la Fundación Catalana del Síndrome de Down, sobre 796 personas con SD. Estudio completo en Josep M. Corretger et al (2005). Síndrome de Down: Aspectos médicos actuales. Ed. Masson, para la Fundación Catalana del Síndrome de Down. ISBN 84-458-1504-0. Pag. 24-32. 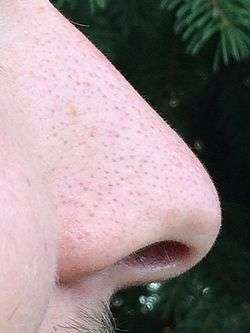 Wikimedia Commons has media related to Human noses. Look up WikiSaurus:nose in Wiktionary, the free dictionary.